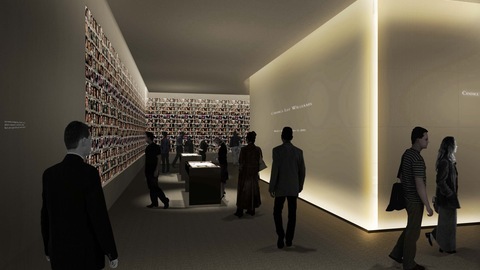 An artist rendering of the National September 11 Memorial Museum. By Squared Design Lab. More than a decade of remembrance later, a $1 billion museum at Ground Zero has still not opened — as New York Mayor Michael Bloomberg and Gov. Andrew Cuomo remain at odds over whose agency will pay for the museum’s operating costs and for how long. See below for a timeline of the controversy, beginning with the museum’s conception in 2005. Sept. 11, 2012 – The museum’s completion has been in flux for a year, and newestimates from the World Trade Center Memorial Foundation estimate at least one more year of constructionbefore preparations for an opening can begin. July 4, 2012 – A series of editorials call for an end to the impasse, including one from The New York Times: “This stalemate feels like a big step backward,” wrote the newspaper’s editorial staff, alluding to Mayor Bloomberg and Gov. Chris Christie of New Jersey’s dispute over money — including future maintenance of the museum. The Times’ editorial staff adds that as neither Bloomberg, Gov. Cuomo, nor Christie wanted to entangle the memorial and museum in a political process, it should not be difficult for the museum to move forward. Feb. 1, 2012 – More Politics: Sen. Tom Coburn, R-Okla., blocks legislation that would provide $20 million a year in federal funding for the museum, citing the country’s debt as a “national security threat,” according to Politico. Sept. 8, 2011 – Watch a time-lapse video of work on the memorial here. Sept. 9, 2010 – A hoisted 50-ton steel column, recovered from the World Trade Center, will eventually compliment the museum’s entryway, according to the Associated Press. Feb. 24, 2010 – Sen. Charles Schumer, D-N.Y., and Rep. Jerrold Nadler, D-N.Y., introduce legislation to create an official 9/11 commemorative medal to raise funds for the memorial and museum at the World Trade Center. Sept. 10, 2009 – On the eve of the seventh anniversary of 9/11, architectural previews of the museum announce plans of a Memorial Pavilion, reflecting pool and quiet spaces. July 2006 – With the foundation’s launch of a Museum Conversation Series, noting the character of “21st century museums,” director Alice Greenwald introduces the institution’s plans with a New York Times quote referencing the Museum of the African Diaspora. April 22, 2006 – “The question is how do we get it right, and who makes final decisions about it. We’re not going to please everybody.” -Alice Greenwald. March 30, 2006 – “All museums in this day and age charge to get in. Somebody’s got to pay the maintenance, and we’re not going to have fewer cops or fewer teachers or invest less in our cultural institutions just to pick up another expense. We’ve got to get the money from someplace, and that’s just the real world.” -Mayor Bloomberg, reiterating the expansive costs tied to the World Trade Center memorial museum. Jan. 5, 2005 – The World Trade Center Memorial Foundation holds its “inaugural meeting” and releases a press release, announcing plans to “construct, own, operate and maintain the World Trade Center Memorial, an on-site museum and a performing arts building. For more coverage from the 11th anniversary of Sept 11. and the controversy surrounding the memorial museum, watch Tuesday’s NewsHour. Politics desk assistant Beth Garbitelli and social media editor Colleen Shalby contributed to this report.